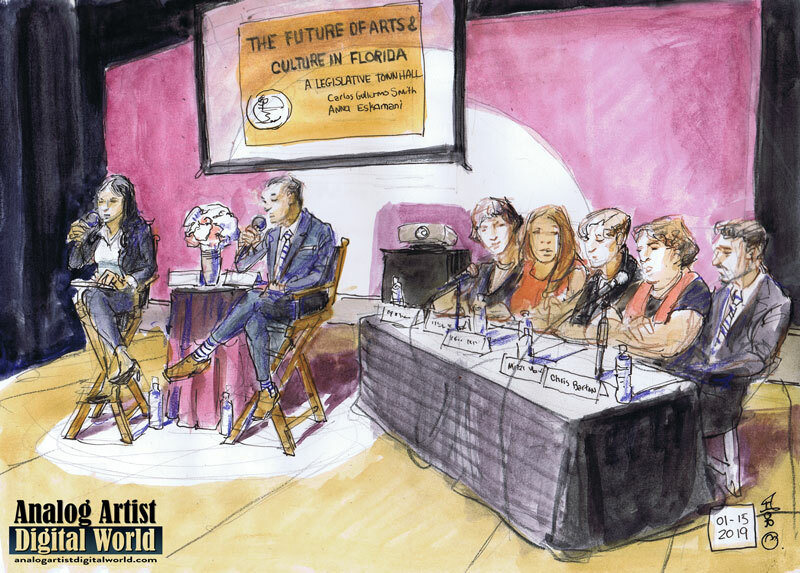 The recently elected Anna Eskamani and Carlos Guillermo Smith, also an activist and member of the Florida House of Representatives, hosted this Legislative Town hall session about the Future of Arts and Culture in Florida. Florida is now ranked 48 of 50 in Arts and Culture funding. Last year the state only allocated 2.7 million for arts and culture non-profits, down from 25 million the previous year. Arts funding dropped an astronomical 90%. Orlando has a vibrant theater community along with world class museums and cultural centers. The bottom line is that the arts cannot grow if there is no investment in the future. Florida is a very red Republican state. Orlando is a tiny blue bubble of artistic liberalism. After Pulse there was no response from Florida Representatives, but that might be because they were out of session at the time. The Marjorie Stoneman Douglas mass shooting however happened while representatives were in session. $400 million dollars were allocated to fund security in the schools across the state including $67 million to arm teachers with guns. This is a solution that only makes sense in the the twisted minds of representatives in the gunshine state. Carlos explained that this was used as an excuse to cut funding for the arts. On March 13, 2019 Terry Olsen is organizing a bus trip up to Tallahassee for Arts Advocacy Day. It is a chance to meet representatives face to face and insist that the $61 million Department of Cultural Affairs grant program (DCA) be restored. The trouble with Florida Republican representatives is that they consider funding going to the arts to be funding LIBERAL Arts. The message that needs to reach their ears is that there is a solid return on investment. For every $1 invested in arts we see $5 to $11 in economic activity in return. It should be easy to see that arts and culture can encourage people to visit Florida. A panel was seated at a long table consisting of Flora Maria Garcia from United Arts, Elizabeth Thompson from the Wells Built Museum, Joanne Newman from the Science Center, Mitzi Maxwell from Mad Cow Theater, and Chris Barton. Each offered their insights into the challenges of being a non profit struggling to get by with the ever-shrinking budget. Mitzi has been applying for grants for over 10 years. In the past, those grants were enough to help her theater grow but now all the organizations are fighting for the same few dollars. There used to be more DCA grants in the past. Funding to DCA has been cut as well. Since Florida is 48th out of 50th in terms of supporting the arts, I decided to research the states that are doing a much better job at supporting the arts. Washington D.C topped the list and Hawaii came in third. Since Washington is shut down, I'm thinking it might be time to move to Hawaii. It is warm, just like Central Florida but less humid, and people really appreciate and invest in art there.